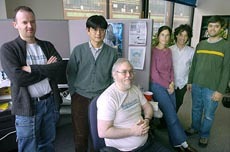 In the early 2000s, after the collapse of WhizBang!Labs, I joined Intelliseek as part of the group of researchers who formed the ARC. In a fit of hacking and inspiration, we created a simple blog tracking site called BlogPulse. We actually launched the site without informing our bosses, which led to some interesting dialgoue. Back in those days, blogs were thin on the ground (I remember first hearing of them from an early advocate - Fernando Pereira). Instead of crawlling RSS feeds, we simply crawled the front page of the blog and did a diff on the content to extract the new material. We then took that content and ran it through some simple but (generally) elegant keyword and phrase extraction technology to determine, on a daily cadence, the hot topics that people were spending their attention on. On that date, we crawled 31, 926 blogs, which contained 12, 954 new entries. BlogPulse went on to innovate with what at the time was possibly the most popular time series presentation of search results (I don't believe we were the first, but we were copied, in at least one case with an exact replica of our HTML showing up on a competitors site). Time series of topics, keywords extraction and trending, they are both still with us and going from strength to strength. Of course, the media has changed, though I find acclamations of the death of blogs to be generally exaggerated. The BlogPulse team believes very much in nurturing researchers in the area of blog analysis. This is why we made a data set of blog content available in conjunction with the upcoming Workshop on Weblogging Ecosystems. Recently, there have been a couple of projects launched that use either BlogPulse or Intelliseek data. One is BlogsLikeThis - a system that helps you look for blogs on certain topics. The second is a piece of art/data visualization called The Dumpster which is generating quite a bit of buzz. I find the conversation around the later to be quite fascinating. Having observed the effort required to create the data that backs the project, the superficial 'this is cool' commentary that it receives is, quite probably, the online equivalent of the few seconds an art museum visitor spends on each piece as they walk, without pause, through the Louvre. There is a nice article in today's Post-Gazette about Intelliseek's Applied Research Centre - of which I am a member. It weaves a pretty good story about our origins as well as the main proposition behind our products: listening to what the world has to say via online content. My only quibble is the focus on blogs - certainly a worthy component of what we do, but dwarfed by the volume found in other online user generated media sources such as boards. That's me on the far left.